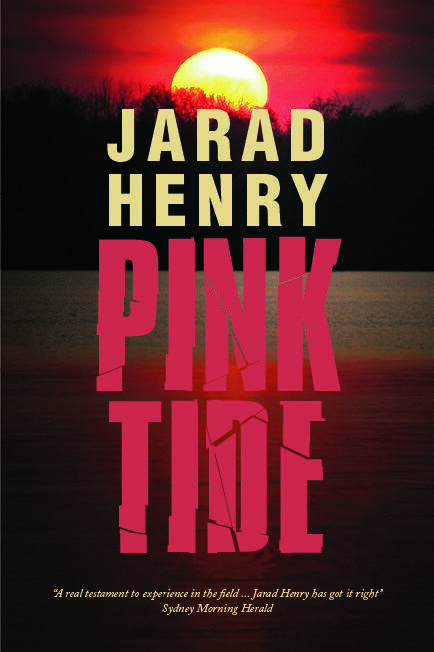 The third novel to feature Victorian detective Ruebens McCauley PINK TIDE follows on from 2008’s BLOOD SUNSET but takes the protagonist from inner-city Melbourne to the small, Great Ocean Road town of Jutt Rock. McCauley has become what is known in the police force as a shipwreck – a cop burned out by their experiences and left to fend for themselves in some out of the way place until they leave the force all together – and needs a stash of prescription medication to get him through the relatively tame policing needs of a small resort town. It’s not unreasonable to wonder then how he will cope when local surfing champion Teddy Banks and his friend Kurt Welsh, who is also McCauley’s nephew, are brutally beaten after leaving a nightclub. With Banks dead and Welsh not expected to survive his injuries locals are angry, assuming the culprit is one of the many tourists visiting the town, and McCauley’s tenuous hold on his new, relatively stress-free life looks to be in serious danger of slipping away. PINK TIDE’s plot is a ripper; full of the requisite number of twists and turns but offering a lot more besides as it explores several topical social themes. The issues surrounding small town residents who rely economically on the tourist groups they can attract but who resent the influx of people flashing money around and engaging in lurid, ‘big city’ behaviours are well teased out. As is the way that people’s prejudices are impossible to hide for long and take little encouragement to rise to the surface in all their hate-filled fury. Like any criminal investigation, it wasn’t a question of truth. In the absence of any physical evidence or witnesses, the question was whether it was a plausible enough story (p164). The only slightly disappointing note of the novel for me is the continued deterioration of poor Ruebens McCauley who seems, after only three books, to have experienced every one of the personal foibles and tragedies afflicting crime fiction’s most tortured cops. At some point during this book he moved, on the virtual list I keep in my head, from ‘basically functional, if occasionally troubled’ to ‘impossibly burdened, wouldn’t want him to be my local copper’. Of course it’s not Henry’s fault that I’ve become a bit weary of jaded, dysfunctional policemen (only one of them is his after all) but I do think it was a bit mean to inflict another major personal problem on the poor man towards the end of this novel as it didn’t really add all that much to the larger plot. Overall though PINK TIDE is a great read: offering a thought-provoking exploration of the social underbelly of polite society and a credible, if maddening, depiction of the more ludicrous aspects of modern bureaucracies. The fact that the revelation at about the half-way point of the central crime’s culprit in no way lessens the tension of the book, which turns then from a whodunnit into a ‘willhegetawaywithit’, is evidence of real skill. It’s summer in Melbourne, Australia and with the city choking on the smoke from bushfires the body of a young runaway, Dallas Boyd, is discovered. At first Detective Rubens McCauley, newly back to work after recovering from a gunshot wound, registers the death as having no suspicious circumstances. However as he thinks about it more he becomes convinced the boy was murdered though it’s difficult for him to convince his superiors of this. He works alone on the case while suspended from duty but when a second teenager’s body is found his boss reluctantly allows him to return to work. 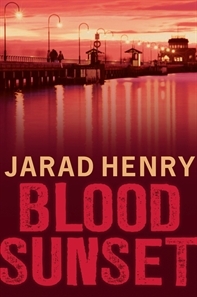 Ostensibly about the case of a murdered boy, Blood Sunset really seemed to me to be more about inner-city Melbourne. McCauley meets a series of people as he investigates the case and each one is used to show some aspect of life in the city. Sometimes these vignettes have little to do with the case, such as the scene which had me in tears where McCauley’s elderly neighbour describes the fear and helplessness he feels over one of his friends who was assaulted while withdrawing money from an ATM. At other times they’re more directly involved with the investigation such as when McCauley meets the social worker who has been assigned to the case of Dallas Boyd’s six-year-old sister who lives with the same step father who abused Boyd. Even McCauley’s personal life presents opportunities to display different sides of city life including his niece’s use of recreational drugs and his own search for the perfect pub gig. All of these threads are pulled deftly together to present a portrait of the gritty side of life in a modern city. There is a very sound police procedural too, with McCauley doggedly tracking down leads and involving anyone he can find to help him uncover what happened to Dallas Boyd. At the very end of the book Henry did introduce one over-used crime fiction cliché, particularly unnecessary when the book is wonderfully suspense-filled without it, but overall it didn’t detract too much from the otherwise excellent story. McCauley is a nicely complex character: sharing some of the foibles of other lone detectives in crime fiction but never becoming unbelievably dysfunctional. His struggle with some personal issues throughout the book is woven into the story well, providing interesting insight into his character without allowing the story to become angst-ridden. None of the other characters had much opportunity to be terribly well-developed and that, for me, was the only other slightly disappointing element to the book. Still, we did get some fascinating glimpses of both the city and McCauley’s personal history through meeting his estranged wife, his brother and some of his police colleagues. I bought this book purely because it was by an Australian author and hadn’t read a single thing about it before embarking on it. I sometimes wish I could approach all books with such a lack of expectations because it offers the potential for a reading surprise which, at least on this occasion, was an entirely pleasant one.